As the Monaco show looms ever closer, Miriam Cain is looking even further ahead and tells me that Camper & Nicholsons have a number of excellent yachts preparing for the Fort Lauderdale Show from October 28th to November 2nd. These include Trinity's 45.7m Vita (ex Cakewalk) and the 42.75 Royal Eagle from Picchiotti, both situated at CNI's Bahia Mar stand on the Face Dock. Vita is an all-aluminium build from the Gulfport yard in 2003 and sleeps 12 guests. 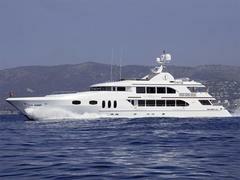 Her mechanics, as well as all of her equipment, have been substantially upgraded over the years and she is asking $19.975 million. Royal Eagle was built in 1989 and refitted in 1996, when her current owners bought her. Sleeping eight guests and with a cruising speed of 12 knots, she's on the market at $7.45 million.